The most important cause of allergenic rhinitis and pollen asthma in North America is pollen from ragweed, Ambrosia, a widespread genus in the Asteraceae. Ragweeds are annual or perennial herbs with lobed or divided leaves ranging from small plants such as Ambrosia artemisiifolia (short or common ragweed) 30 cm to 1.5 m in height to A. trida, giant ragweed, which can reach 4 to 5 m tall . Although 21 species of ragweed occur in North America, most allergy problems are caused by A. artemisiifolia and A. trifida, two species that account for more hay fever than all other plants together. Both are pioneer plants that are well adapted to invading disturbed soils. In natural habitats these species are restricted; however, in areas where human intervention has cleared existing vegetation, ragweed quickly becomes established. Ragweed is monoecious with male and female flowers produced on the same plant. The small male flowers (each with five stamens) are grouped into inflorescences with 10 to 20 florets borne together in a cupule or involucre of bracts. Approximately 50 to 100 involucres occur on each of the many terminal flowering spikes. the thousands of male flowers on each plant result in the release of approximately one billion pollen grains. Pollen release normally occurs in midmorning as dew dries and humidities decrease. In northern areas of the U.S. and in Canada, ragweed pollen release begins in early August, peaks by early September, and is complete in early October. An early killing frost in late September often shortens the ragweed season in northern areas. In southern states of the U.S., including Oklahoma, the ragweed season begins later in August and continues until later in the fall with significant pollen levels occurring through October. In Florida as well as other areas of the Gulf Coast and the southwest, the ragweed season may be much earlier or later with some species of ragweed flowering during the winter and other potentially flowering year-round. One healthy ragweed plant can release up to one billion pollen grains. It is estimated that 1 million tons of ragweed pollen are produced each year in North America. It is well known that weather conditions influence the day to day variability of atmospheric pollen concentrations. Warm dry windy conditions are optimal for pollen release and dispersal, while high humidity and rainfall, conversely, retard pollen release. Seasonal abundance of pollen, however, depends on growing conditions that influence flowering and pollen production earlier in the year. 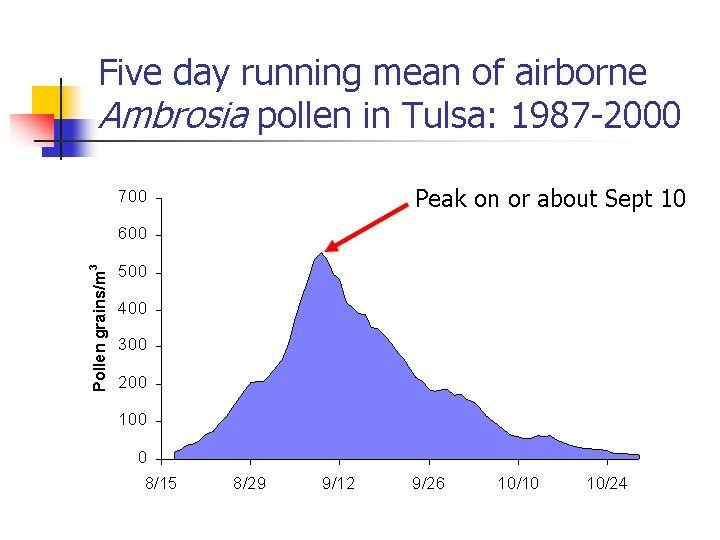 Ambrosia pollen is the dominant pollen type in the Tulsa atmosphere for two and one-half months, from mid-August until late October. It is present in the atmosphere on 96% of days during this period. Although occasional ragweed pollen occurs in the atmosphere before August 15 and after November 1, it is believed that these result from long distance transport and not local sources. Field studies indicate that pollen release of most local ragweed plants begins during the third week of August. Ragweed concentrations generally show a yearly peak during the second week of September on or about Sept 10. The graph below represents the typical pollen season release; however, day-to-day meteorological events will influence the daily concentration. Rainy weather will wash pollen from the atmosphere and also temporarily inhibit the release on new pollen. So a graph of pollen release for one season will typically shows peaks and valleys representing the influence of the daily weather.